Over the past decade, the Canadian economy has become increasingly dependent upon exploited temporary foreign workers, in large part through the Canadian government’s Seasonal Agricultural Worker Program (SAWP), an arm of the government’s Temporary Foreign Worker Program. A new book, Tomorrow We’re All Going to the Harvest: Temporary Foreign Worker Programs and Neoliberal Political Economy, explores with scholarly attention and detail many of the problems inherent in this program. Written by Leigh Binford, professor of Sociology at the City University of New York, this timely book weaves together compelling evidence from the past ten years to show how the SAWP scheme has created an economy based on oppression — providing Canadian employers with a steady stream of cheap labourers who are themselves silenced by the constant possibility of capricious deportation. Housing conditions are particularly emblematic of the program’s failure. Employers provide housing to the contract workers, but because the bottom line proves more important than the workers, the conditions are cost-saving and inadequate. One worker, Jesus, was among thirty migrants assigned to housing with “only three stoves (one of which was often broken), five refrigerators, and seven showers…the returnees, who were familiar with the situation, quickly claimed all the spaces on the dry upper floor, and Jesus wound up along with seven other workers in a cold humid basement. The overcrowding meant that upon arriving back at the house after a day in the greenhouses or fields, workers competed to be the first to use the showers and stoves.” Employers are often concerned enough about the opinions of their neighbours that they “conceal worker housing from the main roads, symbolically marking their exclusion from Canadian society.” Conditions like these have inspired the Social Housing Coalition, here in BC, to demand that housing rights must be extended to temporary migrant workers. All agree that temporary labourers provide efficient and cheap labour to employers and the Canadian economy. In return for their contribution, they are not only forced to endure harsh working and living conditions, but are largely shunned and segregated from the broader community. Canada has taken a page from xenophobes and racists, who are assured they won’t ever have to brush shoulders with these isolated workers. Temporary foreign workers have become the real manifestation of the invisible hand. Government officials have defended the program along humanitarian lines, even going so far as to describe remittances returned by workers as “a form of Canadian foreign aid to participating Third World countries.” But Binford scratches the surface to show that the program’s fundamental logic is one of exploitation, not altruism. For example, Temporary foreign workers currently pay contributions to programs like Employment Insurance even though they cannot collect the benefits. Instead of passing reforms to give foreign workers greater access to the social services they pay for, Binford notes that some Canadian government officials have suggested that the workers’ contributions to EI be seen as an “employee-fee” for having access to our labour market. Binford shows how the Canadian government proactively recruits workers who have little choice but to accept the exploitative labour conditions. Entrants into local job markets in Mexico, El Salvador, and other countries in Latin America and the Caribbean have limited options, and wealthy countries prey on this reality. This recruitment drive has now significantly reshaped the Canadian economy. As of December 2012, there are officially 338,000 temporary foreign workers in Canada through the SAWP program, though unofficially it’s reported as being 500,000. That’s up from 101,000, officially, in 2002. British Columbia currently has about 70,000 of those workers. 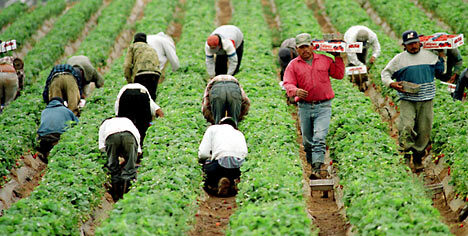 Canada’s SAWP is considered by some commentators to be a “model” temporary foreign worker program for countries around the world. But Tomorrow We’re All Going to the Harvest shows that the program is primarily a model of exploitation, and one that should be discarded. The book shares a glimmer of hope in revealing that “in recent years a few farms have been subject to spontaneous work stoppages in protest of low wages and substandard housing conditions or unfair treatment.” We should stand in solidarity with them, recognizing that this trend violates some of our deepest values, and that we cannot have a just society without justice for temporary workers.